A very old fishing stage located in the historic fishing village of Battle Harbour on Battle Island in Southern Labrador. 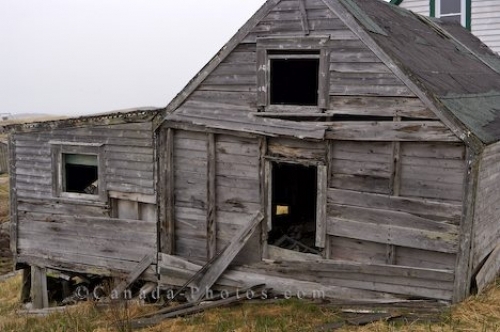 With boards and windows barely intact, an old fishing stage sits along the waterfront of the historic fishing village of Battle Harbour in Southern Labrador, Canada. This fishing stage has seen many long and stormy days off the Labrador coastline and many cod fish passed through this building where they were processed for salting and drying. The cod fishery was first established at Battle Harbour in 1770 which was followed by the first permanent settlers in 1775. The Cod fishery was discontinued in 1991 and people abandoned their properties on the island and now Battle Island is a tourist attraction for all to see. Old fishing stages along the shore at Battle Harbour, Battle Island at the entrance to the St Lewis Inlet, Viking Trail, Trails to the Vikings, Southern Labrador, Labrador, Atlantic Canada, Canada. Picture of a run down fishing stage in the historic fishing village of Battle Harbour in Southern Labrador, Canada.